Heavy-duty plastic nestable steps. DPI’s industrial strength polyethylene steps are available in a range of sizes in both standard and nestable models. 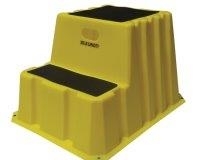 Steps have a 500-pound capacity and features anti-slip surfaces and anti-skid rubber feet. Standard 1- 2- & 3-Step models featuring inside storage for added functionality. NST-2 Nestable Plastic Step: 32 3/4 x 25 3/4 x 20 1/2"